Melia volkensii | Infonet Biovision Home. It is native to Ethiopia, Kenya, Somalia and Tanzania. 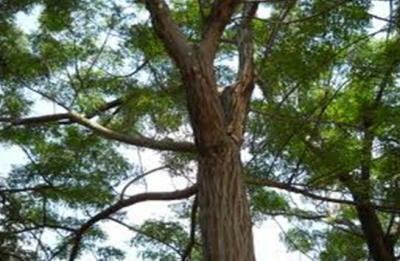 It is a valuable tree in the ASALs of Ethiopia and Somalia south to Tanzania. 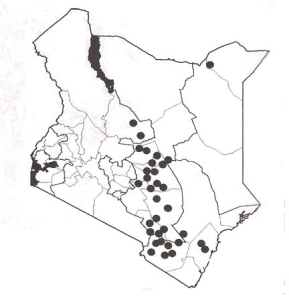 In Kenya is found in Kitui, Mwingi, Machakos, Embu, Taita, Samburu, Isiolo, Makueni, Voi, Tsavo National Park and Moyale in dry bushland or woodland and drier wooded grasslands. Wood hard, brown, and makes good timber, resistant to attack by borers. It is a highly prized tree in the dry areas where it is intercropped with food crops with no adverse effects and occasionally improved yields. Altitude ranges from 400 to 1,650 m and in Agro-ecological zones V - VI. Does well in sandy to sandy-clay soils to riverine clay/ sandy soils. It may be propagated by seedlings, root cuttings or root suckers, wildings. The tree grows faster if propagated using root suckers. Young trees needs to be protected from goats and coppicing can also be done. Occurs in mixed / agroforestry systems. Fodder: Farmers believe leaf fodder is of high quality for both cattle and goats. The tree comes into leaf and is pruned for fodder towards the end of the dry season, a time when fodder is extremely scarce. Goats eat the large, fleshy drupes after they fall. The fruit pulp is reported to contain almost 10% crude fat and over 12% crude protein; the mature leaves are reported to contain over 5% crude fat and 21% crude protein. Apiculture: M. volkensii is one of the principal species used to make log hives because the wood is easily worked and shaped and also flowers provide excellent bee forage. Fuel: Branches lopped during routine management and to provide fodder are often left to dry in the field before being used for firewood but it produces an unpleasant smoke though. Timber: The wood is easily worked and shaped, making it suitable for making acoustic drums, containers and mortars and is decay resistant comparing favourably with Ocotea usambarensis, Vitex keniensis and Khaya species. Poison: Leaf preparations are used as flea and fly repellents; they are said to be particularly effective on goat kids. Soil improver: some farmers observed that the heavy leaf fall of M. volkensii during the later stages of crop development may increase crop yields. Intercropping: In Kenya is believed that M. volkensii is compatible with all crops grown. No serious pests and diseases have so far been associated with M. volkensii in either natural populations or trees on farms. Animal damage through browsing and trampling does occur, especially when they are young. In the wild, however, the tree has been reported to suffer some damage from elephants.